At least 12 persons, including minors and an on-duty policeman, lost their lives during immersion ceremonies on Anant Chaturdashi, marking the end of the 12-day long Ganeshotsav celebrations throughout the state on Tuesday, officials said. Four persons drowned in the Indrayani river in the twin cities of Pune and Pimpri-Chinchwad, three in Aurangabad, two in Jalgaon and one each in Nashik and Beed during the day as thousands of the gigantic, large, medium and small idols of the popular elephant-headed god, Lord Ganesha, were taken out for immersions in various water bodies. In Mumbai, an Assistant Sub-Inspector who was posted on Ganeshotsav duty at Lalbaug in Parel, suddenly collapsed and died. Further details were awaited. One person was reported to be missing in Indrayani river in Pune and a search is on to trace him, officials said. Earlier in the morning, idols of Lord Ganesha were taken down from their pedestals amid chanting of the “Udvasana Mantra” and carried out of the various marquees, societies and individual homes in Mumbai, Thane, Pune, Kolhapur, Nagpur, Nashik, coastal Konkan districts and other towns in the state. This was the 125th year of the state’s biggest public festival, started in a modest way by Lokmanya Bal Gangadhar Tilak in 1894 to rally the masses during the Independence movement and bypass restrictions imposed by the British rulers on public meetings. Chief Minister Devendra Fadnavis and is family members immersed their idol in an artificial pond outside his home, while several ministers and lawmakers joined the festivities by dancing, playing ‘lezim’ and beating drums with the public. Tight security by multiple agencies was in place in Mumbai since the Ganesh Chaturthi on August 25 with over 40,000 personnel of the Mumbai Police, teams of Fire Brigade, the Indian Navy, the Indian Coast Guard, disaster management units deployed. 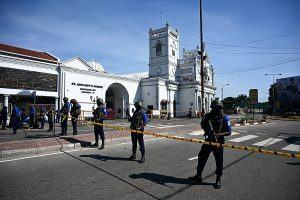 Besides, helicopters, high-speed patrol boats and hovercrafts watched over the coastline, and over 5,000 CCTVs closely monitored the western megapolis. Drones too kept an eye in Mumbai and other cities both for aerial surveillance and for beaming real-time images to the monitoring agencies during the immersion ceremonies. A team of Disaster Amateur Radio Emergency Services, an amateur HAM radio operators’ group, was also active at various spots in Mumbai. The main immersion site in Mumbai was the the historic Girgaum Chowpatty which attacted several lakh people, including domestic and foreign tourists. Top officials like Police Commissioner Datta Padsalgikar and BrihanMumbai Corporation (BMC) Commissioner Ajoy Mehta personally kept a tab on all the developments. 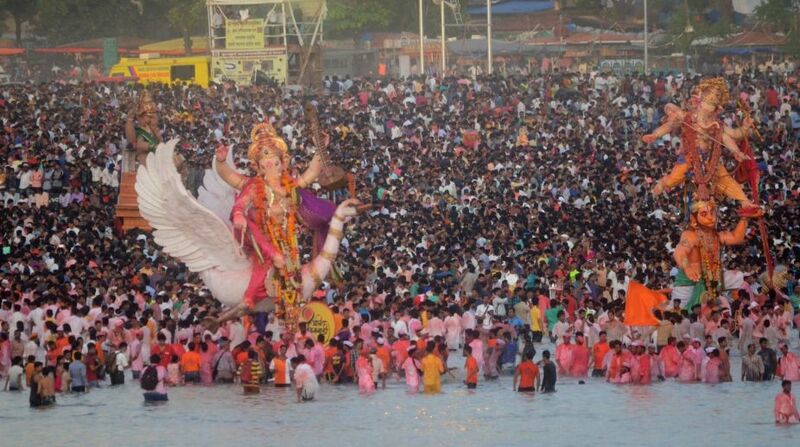 Thousands of domestic idols also joined the giants for immersions at the Dadar Chowpatty, Mahim seaface, beaches of Juhu, Versova, Gorai, Madh, Marve, Manori, Sanjay Gandhi National Park and Aarey Milk Colony, natural ponds and artificial water bodies created for an eco-friendly immersion all over Mumbai. Besides Mumbai, the other major immersions have begun in the coastal district of Palghar, Thane, Raigad, Ratnagiri and Sindhudurg since daybreak, in the presence of lifeguards provided by various civic bodies and volunteers at the seashores, beaches, local rivers, lakes and ponds. The immersions are expected to continue till late in the night. This year, Mumbai hosted around 11,550 big Ganeshotsav celebrations with budgets running into several crores of rupees; 190,000 medium or small groups with budgets of around Rs 500,000 to Rs 5 million, and millions of individual households in Mumbai and rest of Maharashtra. Naresh Dahibhavkar, the President of BrihanMumbai Sarvajanik Ganeshotsav Samanvay Samiti, said this year there were around 300 gigantic idols in public marquees within the prescribed height limit of 18-feet. This year, the Maharashtra Tourism Development Corporation made special arrangements for domestic and international tourists from the US, Europe, Japan, Thailand and other countries to view the immersion ceremonies at Girguam and other places as part of its new intiative — the Ganeshotsav Tourism. As usual, some of the biggest idols were seen in Mumbai at the famed Lalbaug-cha Raja, Ganesh Gully, Borivali’s Kastur Park, Sewri-cha Raja, Andheri-cha Raja, Fort-cha Raja, Khetwadi, Bandra and Shivaji Park which are due for immersions later in the night, with the ceremonies likely to continue till Wednesday dawn. Post-immersions, several NGOs, celebs, students and volunteers have announced elaborate beach cleaning programmes in Mumbai, Thane, Raigad and other parts of the state.